Belkin YourType bluetooth keypad - anyone have experience with it? Discussion in 'Mac Accessories' started by kwijbo, Jun 25, 2014. Perfect aesthetics but the reviews I've seen around the web are varied - some complain of connection issues, some say its perfect. Maybe there was a firmware update which corrected those issues? Maybe there's issues with older machines but newer work perfect? I don't think you'll get many responses.....this isn't available yet according to the Belkin website. There are several reviews from that time also. I saw one at an Apple store a couple days ago and am wondering if maybe a revised version is starting to trickle out. + From a form/fit aspect it is the closest keypad I've seen that matches the Apple keyboard. Others are made of painted plastic. + Pairing wasn't a problem but OSX sees it as a standard keyboard. Some users may experience pairing issues if they get hung up on the fact that OSX doesn't recognize the exact model. - User cannot change the name of the keypad like you can with Apple devices. Shows up as "YourType Wireless Keypad"
- The keypad does not report battery level via the OS. I usually swap out the batteries when I swap out the keyboard batteries. When I first use the keypad (after it's asleep) there is a delay in the first few key strokes while it wakes up. After about 2 seconds all the characters you typed show up on screen. No keystrokes are lost so I've gotten used to just typing and knowing that it will catch up. Thanks for checking in - I got it shortly after posting that and can echo some of your sentiments. -Agree on form completely, its about as close to a perfect match as I can imagine short of Apple producing one themselves. -It is a bit odd that it shows up as a standard keyboard. One time when paired it asked me to push the key immediately to the right of the left shift key. -No battery level is definitely annoying. Also, I took my keypad on a recent trip and forgot to turn it off, after about 48 hours the batteries had totally drained. -I purchased at an Apple store about a month ago, the box included AA batteries however they expired in August of 2013, making me think this had been sitting around for over a year. They were dead of course, which is a minor annoyance but also is not the greatest vote of confidence. What if there was a hardware revision in that time? -Lastly, this is probably unique to my situation, but I can't get it to pair when I'm on 2.4 Ghz WiFi. When I originally set it up I was on 5 Ghz and it worked no problem but have since moved to a temp location and only have 2.4 Ghz. I have an Apple bluetooth KB, a Logitech mouse with unifying receiver, the number pad and my WiFi in the immediate area. Anytime I try to connect the keypad I get bounced off WiFi immediately, so I haven't used it in 3 weeks. Called Apple support and they gave me the usual script, reboot, try guest account, check hard drive for errors, which were all fruitless of course. She recommended calling back and asking for a senior tech, I'm not sure how much more time I feel like wasting on this so I have yet to try. I'm using this one myself, from LMP. Last year, I paid a visit to the nearby Apple Store and replaced my old iMac 2008 (USB keyboard with numeric keypad) with an iMac (late 2013) which came with the smaller Bluetooth keyboard that doesn't include a numeric keypad. At purchase, I substituted the Apple Bluetooth Trackpad for the Magic Mouse (already had one of those). I could have used my old iMac's USB keyboard to get the numeric keypad, but I enjoy the ability to move the keyboard around without it being tethered to the iMac by a cord. So when I returned to the Apple Store several weeks ago and received assurance that I could return the Belkin numeric keypad if I was unsatisfied with it (I'd read the reviews), I bought one. So far, I've been completely satisfied with it. It visually matches the iMac's brushed-aluminum keyboard and trackpad perfectly. * During the Bluetooth pairing, the Bluetooth software apparently thinks it's a normal keyboard and requests that I press one of its SHIFT keys, which of course it doesn't have, to ascertain which layout I have (I guess). After tentatively pressing some other keys, I was able to manually select the US keyboard layout. I've never had to revisit the Bluetooth setup again. * There's no System Preferences control panel for it, so there is no battery condition indication. * When I open the OS X Keyboard Viewer, it shows the native keyboard (no numeric keypad). 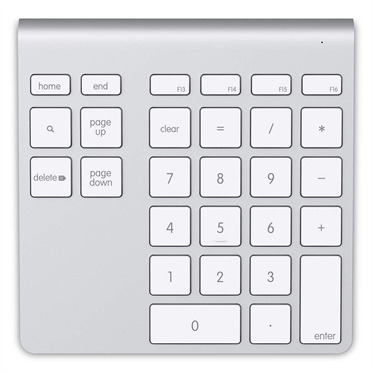 When I then press the CLEAR key on the Belkin pad, the viewer expands the keyboard to include a numeric keypad with the standard Apple layout, which differs only slightly from the Belkin layout. Got one today and just got it working before returning it. The trick to getting it to work was removing the batteries and resetting it. Belkin would probably save some returns if they included this in the manual...and also included that the setup is a joke and tell you how to actually do it....ie press a key that doesn't exist and then select the US setting. As it is they just say to "follow the instructions" ....which will probably lead to frustration, low ratings, and many returns.